Welcome, my name is Amporn Whitehead, my business is called Thai Kitchen in Lakeland. I live in Windermere, which is in the beautiful Lake District. Previously, before coming to live in England in 1997, I worked in restaurants in Thailand. 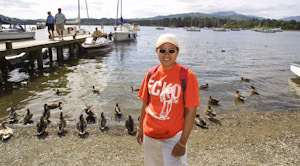 After coming to live in England I worked at Thai restaurants in Ambleside and Bowness. I established my business in 2006 to provide a Thai catering service for dinner parties and special occasions in private houses around the south of the Lake District. I usually cater for up to 14 guests and can travel to areas within about 25 miles of Windermere; such places as, Kendal, Ambleside, Grasmere and Windermere. I have always loved cooking, as most Thai people do, and started cooking from an early age in my family home in Saphilum, which is near Petchabhun, in central Thailand. I provide everything that is needed to cook your Thai meal: the crockery, glasses, table coverings, and the Thai music. I also cook and personally serve your meal, and afterwards even wash-up and clean your kitchen! All that you need to do is to sit back and relax, everything will be taken care of, leaving you time to spend with your guests. On the web site there is an online menu, where you can find information and select the dishes you desire. After you have made your selection you just email your order to me. I will then contact you and help you with the arrangements for your booking. I can also help you with your choice of dishes and explain them in greater detail, to cater for any special requests you may have, such as food allergies, and dietary requirements.